DPG Series Pneumatic Gripper is a parallel 2-jaw gripper with excellent parallelism and accuracy between the gripper mounting surface and jaw surface. Jaws can be mounted on the bottom or side and are supported throughout the length of the body to make this gripper an extremely robust, yet compact, design. They are also available with optional spring assist ("-C" option) on the close stroke to prevent the part from being dropped in case there is a loss of air pressure. They are available in stroke lengths from 6.4 to 25.4 mm with a gripper force of 222 N. The DPG pneumatic gripper shielded design allows this gripper to be used in harsh environments. The DPG pneumatic gripper is a modular component and can be mounted to DLT Linear slides or DRG Rotary Actuators without additional adaptor plates. They can be mounted on the top or side and have air ports on the top, side and front to support mounting and operation in any direction. Top manifold air ports can be used to help eliminate tubing and fittings at the gripper location. 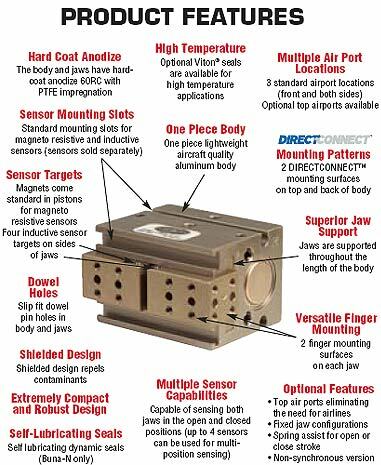 Accessory mounting slots make it easy to add magneto sensors and inductive sensor kits are available, the grippers have built in slots for inductive sensor targets. Note: Add suffix "-C" to model number if requesting spring closed configuration.